This comes totally out of the blue…but its rather fitting with the time. This is Meaghan + Rick. They’re getting married in a few weeks on a hot sunny beach. They contacted me about an engagement shoot and or a Fearless Bridal shoot after the wedding. They also contacted my arch nemesis, Jeff Cooke. There was a lot of screaming and yelling but in the end it was decided that Jeff would shoot the pre wedding engagement shoot and Applehead Studio would shoot the Fearless Bridal session next spring. 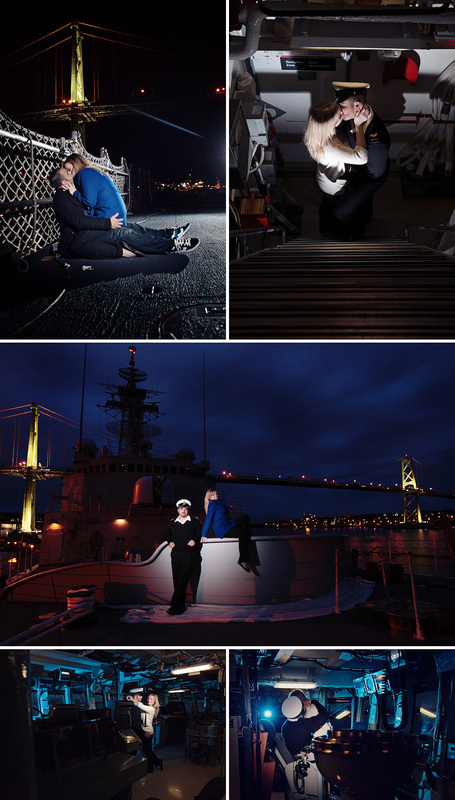 When I found out where the engagement shoot was (on a navy ship down in the dockyard at night) I volunteered to come along just in case they needed backup. This was also the night I decided it was time to try some new camera gear. I stood side by side with a Nikon camera and while I waited and waited for focus, my arch nemesis was 50 shots in and I never did get the shot. At one point Steph and I just packed up the gear and stood around pouting because it was too dark. I hadn’t looked at the 10 images I shot until the other day. That same day I get an email from the guys behind this genius new script for to create blog stroyboards. Its called Storyboard. I’ve never found an efficient way to blog a series of images into a nice blog spread. Trying to arrange the images in a nicestory telling spread and running actions and saving this and saving that. It was a slllllow process…so I didnt do it. Storyboard is a script that creates a one file….storyboard. In less than 5 minutes I figured out how to use it and I made this blog post image set in about 45 seconds. Its brilliant. It’s got one purpose and it does exactly what its supposed to do. It will resize high rez images and set the width to whatever your blog width is and allows for batch actions before it saves. Included is a simple pdf user guide which is pretty straightforward. I had it installed and created a storyboard in less than 5 minutes (does not include editing time!). I have no idea what this will sell for or where to buy it yet but I give it two thumbs up. I’ve already made shortcuts and made it a part of my workflow.